Today must find the internet. It’s a grand mission, and it’s mine. There are practical concerns with which I must treat: train tickets, apartments or hostels, and some kind of plan for the second half of July. The first few days take me from Germany to the Czech Republic, and I know not where therein, apart from some unspecified number of days in Prague. The entire Czech portion of the trip is being arranged by my fiancé, and I’m largely just leaving her to that bit of planning. Upon our return to Germany, though, at mid-month, we have no specific plans. I have to find internet service in order to pitch her my ideas to get her go-ahead for planning. Finding internet access in Europe is not as easy as it seems to be in the states, though maybe it’s just as tricky back home if one lacks a car and a web-enabled home address. I walk past six cafés before finding an open one advertising “wifi hier”. It’s on Torstrasse, about four blocks from my apartment. “Ja,” comes the reply; and then, in English as faltering as my German, she explains: “the password is here.” She points to a small black sign with the words, auf Englisch, “coconut-milk” written in neat, white pen. “Danke shön,” I remark. It’s always scary for me to go off-script in German conversation. I usually lose the thread immediately. Something we never discussed in our philosophy of language courses is the part that expectation plays in conversation. When one comments or questions and receives a response that’s not within the range of probable or otherwise expected utterances, it’s positively confusing. If the exchange is in English and there are no signs apart from the strange reply that would make me think my interlocutor is insane, I would just as likely think that I’m a bit off, or have misheard. In conversation in a foreign tongue, I only feel foolish. So much of this trip is about feeling foolish, or worrying about seeming foolish. I take a deep and unmitigated pleasure in accessing the internet at what used to be considered average speeds: social networking platforms, emails, and train timetables as well as city maps – all at the tips of my fingers. Today is a good day. It begins to rain and I edge under the café awning. 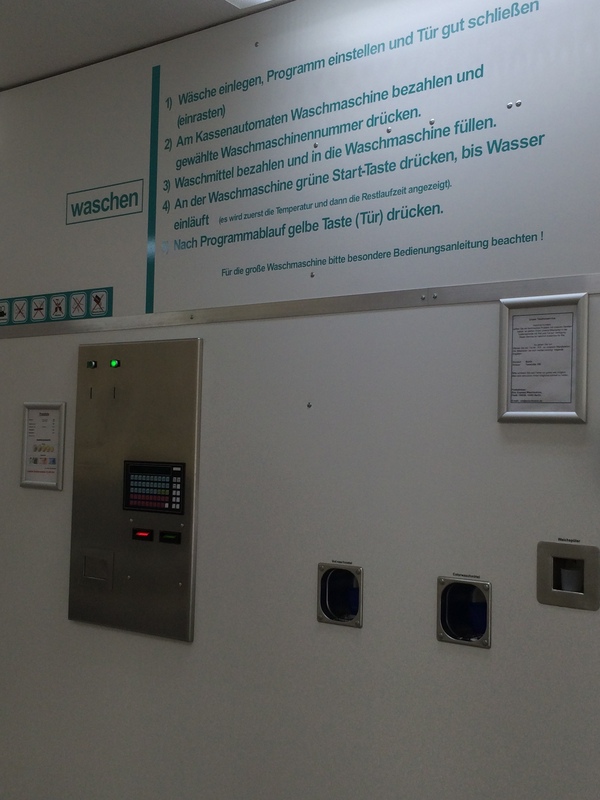 Later in the day, I make my way back to the apartment, back to Torstrasse, and to a Waschsalon (laundromat). I work at interpreting the instructions on the walls and meet two fellows from Boston, a girl from Brazil, and a retired couple from Australia. I love my time in the laundromat, conversing with strangers. This entry was posted in Travelogue and tagged Berlin, cafe, cafes, language, the internet, travel, travel planning. Bookmark the permalink.